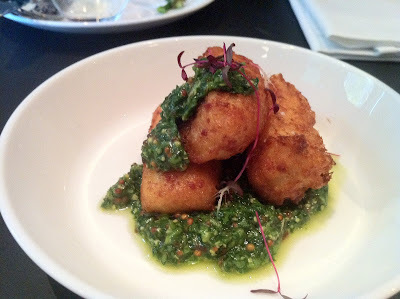 When people find out I'm a food blogger, their response is invariably "So which is your favourite restaurant, then?". Actually that's not quite true - their first question is usually "What's a food blog?" but once that has been explained, that's their second question. And without trying to be difficult, my response to that is "I don't really have one." Because I don't - I have many favourite restaurants depending on mood and location and cuisine, and picking just one is pretty much impossible. How on earth do you compare the spice and fire and belly-aching fun of Chilli Cool with the sophisticated French style of Racine or the gutsy, comforting British fare at the Harwood Arms? They're all brilliant places in their own way, equally enjoyable, equally rewarding. And yet here we are, and I imagine you've already noticed the title of this post, so obviously I do think one particular restaurant has something to mark it apart from the rest. Before I get on to explaining my reasons, though, and in the spirit of various other far more experienced and respected critics, here's a brief summary of the best and worst of 2010. Best bar is a difficult one, because although I enjoy knocking back a rhubarb gin and tonic as much as anyone in the glittering downstairs space at Bob Bob Ricard, and believe me I have done on far too many occasions this year, we still can't escape the fact that Brian Silva's bar at Rules is still the pinnacle of achievement in this field, and so, for the 2nd year running, it's still my favourite place to pop in for a drink. If you can, try and go while the Christmas decorations are up - with the log fire going and the smell of pine, it's the most wonderfully festive place to guzzle a Negroni. 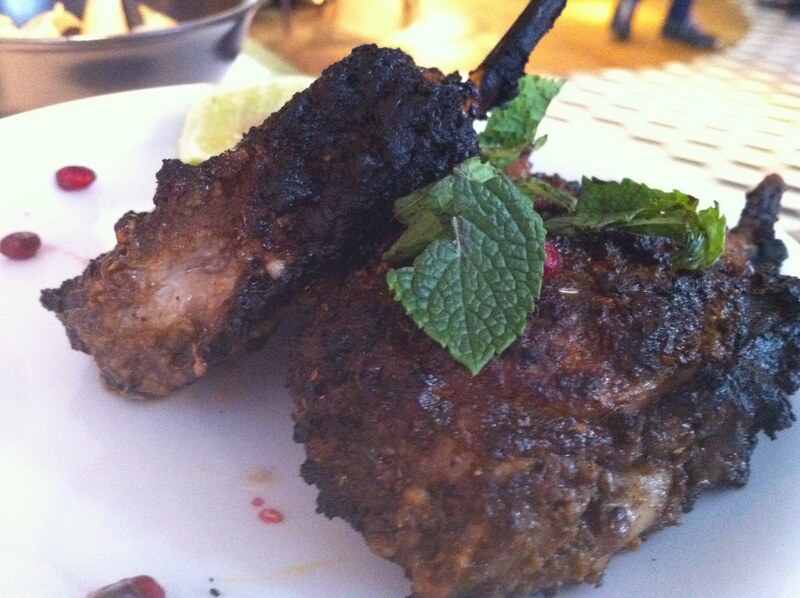 Best PR campaign special mentions go to Twitter kings @Polposoho and @DishoomLondon, who by simply engaging with all feedback, good and bad, in a friendly and professional way have shown, by example, the very best way to use social media to spread the word about your restaurant. It surely helps that they are both great restaurants, but their energy and commitment are still impressive. The overall winners, however, are the guys behind the Owl and Pussycat in Shoreditch, who left such a thoughtful, reasoned and detailed response to my rather grumpy review that it even made me want to go back and give them another go, which I guess is exactly the reaction they were hoping for. So well done them. 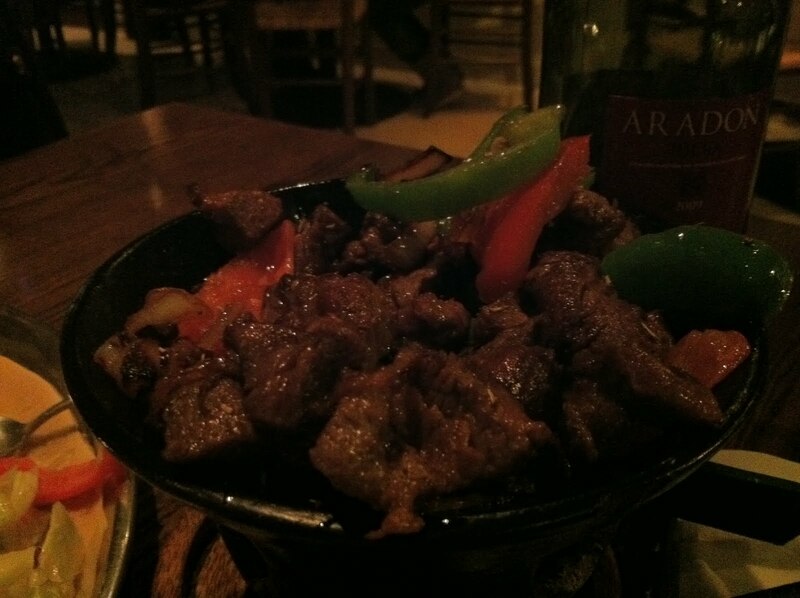 There have, sadly, been plenty of contenders for worst PR campaign, not least of which Cantina Laredo who began by booking in various groups of bloggers to try their new "gourmet" Mexican restaurant, then promptly cancelled them in a fit of pique when we all started writing up our awful meals. Then they tried a different, equally worrisome tactic - inviting rival restaurateurs in for a free meal, taking a photo then posting it on Twitter as if it was some kind of official endorsement. That Cantina Laredo is a hugely overpriced, mediocre Covent Garden tourist trap isn't really the issue here - their cackhanded response to criticism should serve as an example of how not to go about managing the image of your business. But the defensive attitude of Cantina Laredon't pales into comparison to that of Dego, who as the only restaurant ever on this blog to have their PR "guru" openly leave belligerent comments on a bad review of their client, as well as presumably cajoling friends and staff to do the same on this and other restaurant review sites, take the crown for worst PR campaign overall. I am, however, eternally thankful to "jp", "Liza C", "SP" and the rest of the Dego shill gang for being so entertainingly useless. 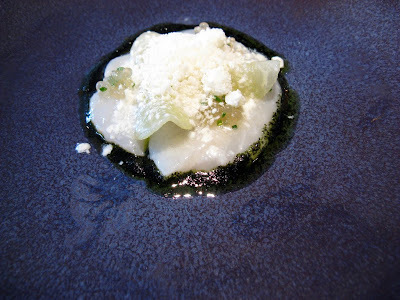 On a similar note, I'm sure I would be justified in making Dego my Worst overall restaurant, as my meal there was truly appalling, but let's not forget, back in August, a restaurant so diabolical, not just inept but actually pro-actively evil, that in comparison makes Dego look like the Fat Duck. Please, please Aberdeen Angus, I beg of you, please go out of business as soon as you possibly can. London and the world will be immeasurably better off with your demise. Now, on to best overall restaurant. 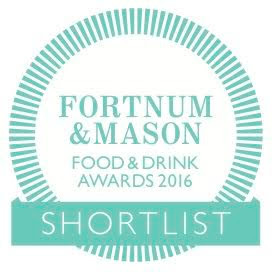 I had many, many fantastic meals this year, more than I could ever hope for and certainly far more than I can safely mention here without either boring you all senseless or leaving some very worthy contenders out. But honourable mentions should go to Polpetto, a charming and shabbily glamorous room tucked away up an anonymous staircase in Soho that serves some of the very finest and most interesting Italian food in London; Hawksmoor and Goodman, which manage to outdo each other on every visit and are the finest ambassadors to British beef - and British steak restaurants - you could wish for; Brawn, a brave and brilliant new restaurant in Hackney which is an instant classic; and I could hardly go without mentioning my two favourite Vietnamese places, Mien Tay in Battersea and the Viet Grill in Shoreditch, each always great fun. 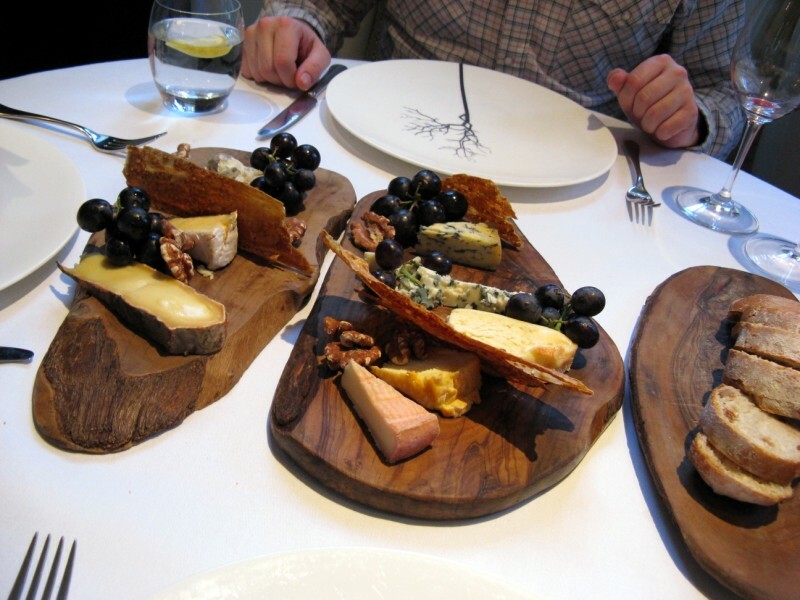 Why then, overall, the Ledbury? A few reasons, not least of which the food, which is as close to perfection as you could ever want and never fails to satisfy on every single level. The dishes that Brett Graham is turning out are not just wonderfully presented, technically brilliant and bursting with fresh, seasonal flavours, they always have that extra touch of mystery, a surprise ingredient or an unusual texture that speak of a true craftsman at the very top of his game. I can still remember the first time I ate his scallop ceviche with horseradish snow - the sweet plump scallops topped with spicy ice, surrounded by a slick of bright green pesto, a perfect dish if ever one was made - and I'm sure I will for the rest of my days. 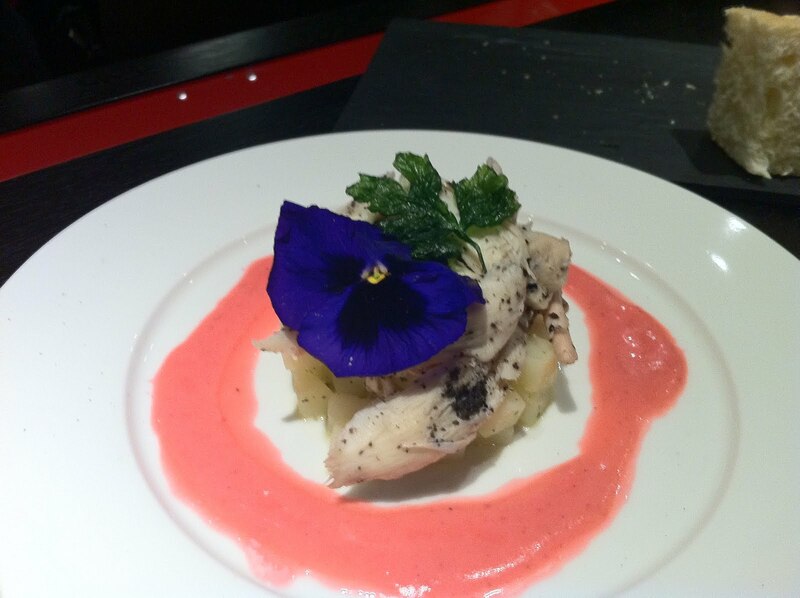 But add to that the service, professional and friendly without being too stiff or too casual, a bright and comfortable room, and a good value lunch menu, and you have yourselves the best restaurant in London. Much as I was tempted to award less high-falutin' (and let's face it, cheaper) establishments the top gong, I find myself looking forward to my meals at the Ledbury with childlike glee and giddy excitement that is matched by nowhere else. Looking forward to 2011, trips to Japan, New York and Italy are on the cards if the snow ever melts, but closer to home the first big red mark on the diary is Heston Blumenthal's Dinner, where I'm booked into with a combination of optimism (for a new direction for this obviously talented chef and the team behind him) and fear (for my bank balance). But aside from such big-name arrivals, and mindful of the howls of protest I will surely receive from fans of Madrid or New York or Tokyo, I am fiercely of the opinion that there is no greater place in the world right now to eat out than London. Maddeningly wallet-draining it may occasionally be, but for sheer variety, exuberance and idiosyncratic charm, there is nowhere like it, and nowhere else I'd rather be. So many thanks, as ever, to everyone who has read this blog at any time over the last 12 months, in numbers that bewilder as much as they delight, and all the best for Christmas and the New Year. For a restaurant in the basement of a not very attractive building (the boxy Intercontinental), Theo Randall doesn't seem to be trying particularly hard to stand out. Around the back of Park Lane, past a windswept taxi rank and through double doors to a bare, echoey corridor, you finally arrive at the above. Hardly inviting, is it? Looks more like a corporate boardroom than the entrance to a fine dining restaurant, but fortunately the pleasant staff inside do their best with the less than cosy surroundings (think Bar Boulud, only not quite so characterful) and by the time we got around to ordering our hearts - not to mention our toes - had thawed somewhat. 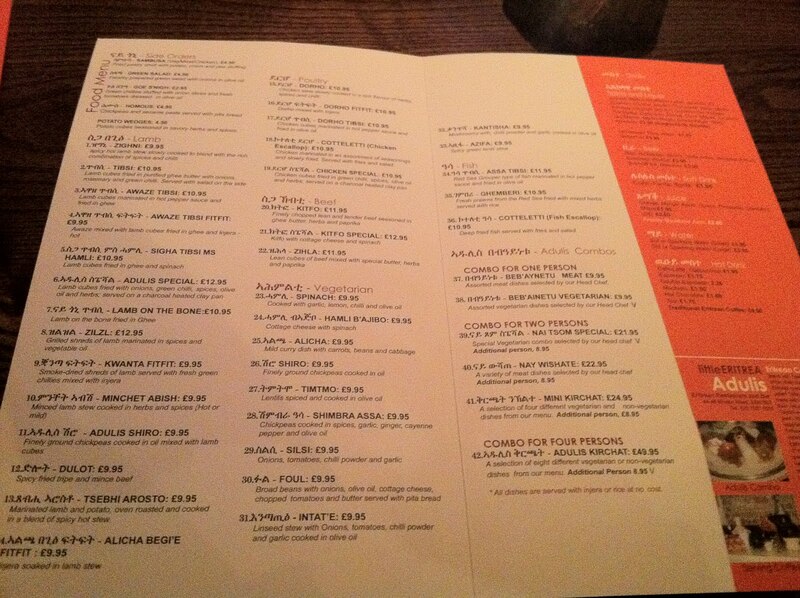 It's a big menu, with just about enough variety to satisfy most dietary requirements. Beef carpaccio, fried scallops, sage and ricotta ravioli, sea bass with potatoes, all hearty and rustic and fine, but even at this stage, I was worried. It all seemed very... if not dull - that would probably be unfair - but uninspiring. 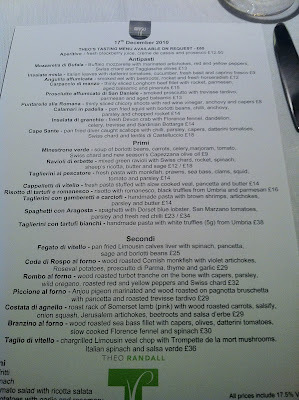 There were very few unusual ingredients, save a bit of lobster or white truffle, or exciting sounding dishes - in fact, it would be a stretch to describe anything on this menu at all as unique in London. The only eyebrow-raising thing, in fact, were the prices - £18 for said scallops as a starter, £12 for the vegetarian ravioli, £30 for the sea bass; I realise that location plays a part on the mark-ups and you can't serve anything too wacky to a 5* hotel crowd, but I couldn't help feeling underwhelmed. And that was even before the food arrived. Against expectations, my calamari in padella were actually a pretty generous portion - so generous, in fact, I was worried I was filling up too quickly and left half of them. 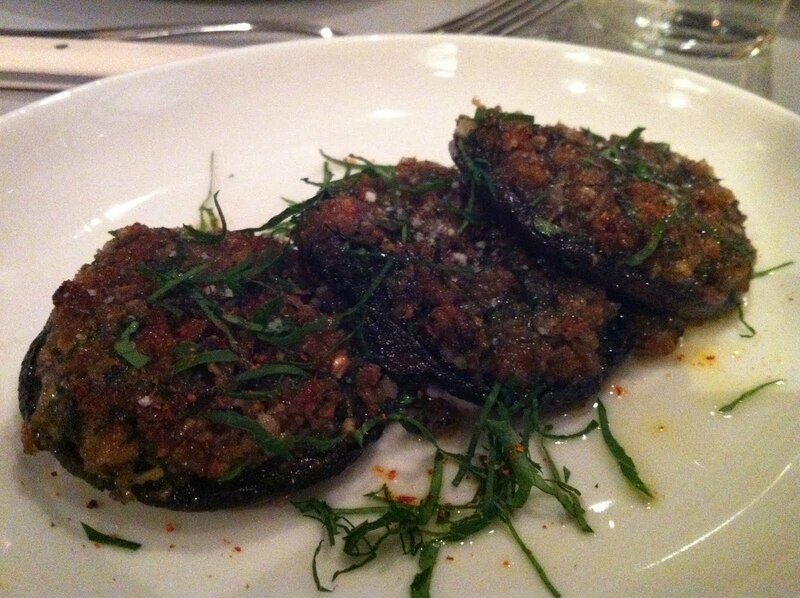 They were decent enough - cooked correctly, nicely seasoned with the salty anchovy and chilli, not much to complain about on that front, and the presentation made sense in the context of rustic Italian food if not really in the context of a Park Lane hotel restaurant. Nice, though. 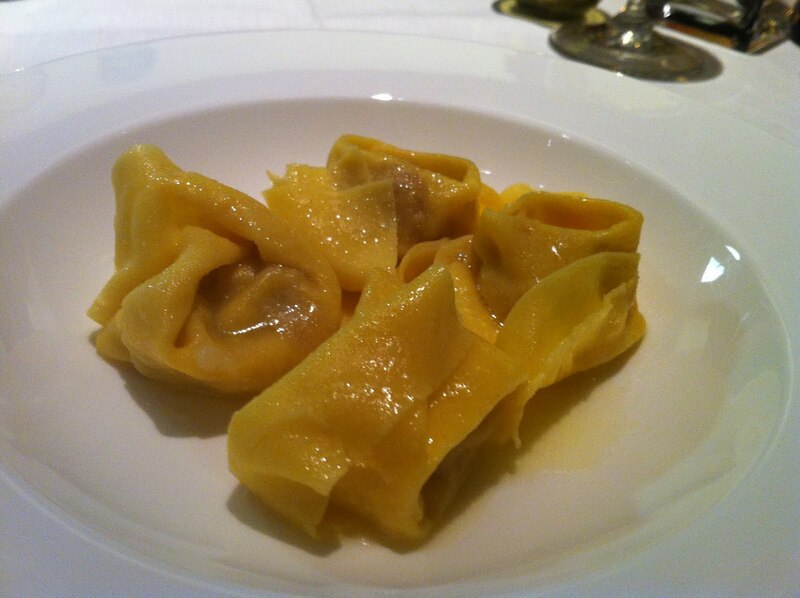 We had a portion of the veal cappelletti split between two, in a budget-minded attempt to sample as much variety as possible. I'm afraid we detected very little of the veal and pancetta filling, and what was there was rather bland, and although the flavour of the pasta itself was good - eggy, obviously fresh, and seasoned well - it was rolled quite thickly and seemed rather clumsy. 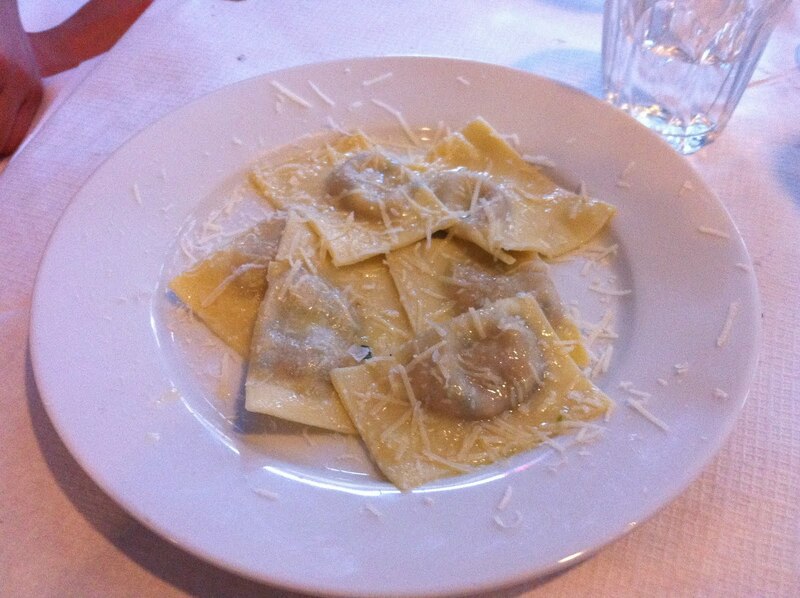 Contrast, for example, with these wonderful ravioli from Trullo, altogether more balanced, glossily addictive and about half the price. Marinated, wood roasted pigeon with pancetta is the kind of thing I will always order when I see it on a menu. I love pigeon, and this example didn't disappoint at all, being gamey and bloody and amazingly plump - in fact it was probably the biggest pigeon I've ever seen in my life, almost the size of a small chicken. I liked this dish, from the crispy fried pancetta to the bitter radicchio, and the mixture of textures and flavours were very good indeed, but then you'd hope so for £30. 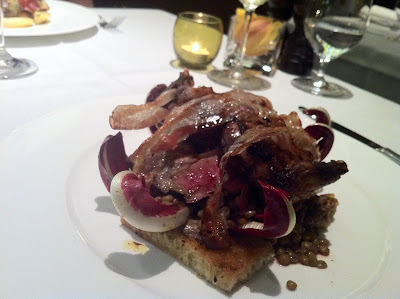 The pigeon and pancetta at Polpetto is £7. Just saying. And talking of Polpetto, here we have our problem in a nutshell. 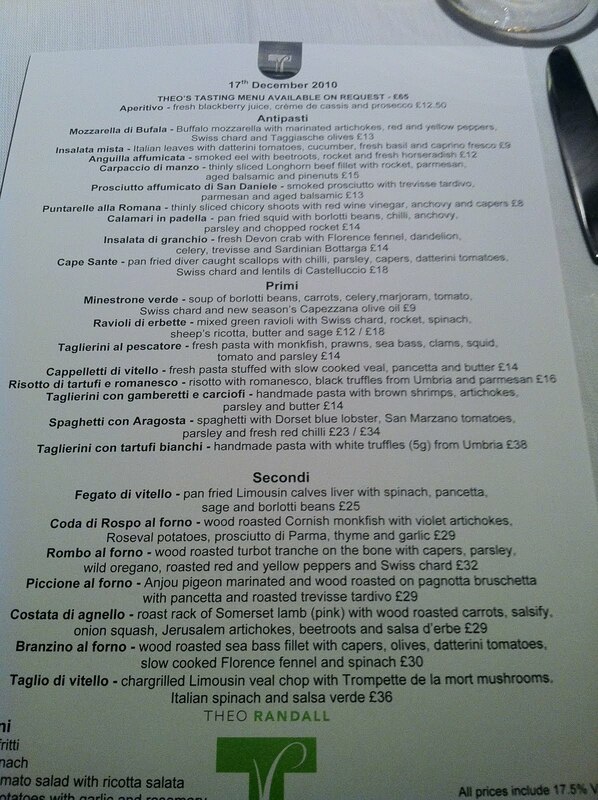 Perhaps four years ago when it opened (my how time flies), Theo Randall would have been one of the few places serving good Italian fare in the centre of London. Perhaps paying slightly more to go here for your beef carpaccio or veal chop would have been preferable to risking the local Mamma Mia or (shudder) Spaghetti House and it all would have made more sense - certainly, the rave reviews I read in those early days have stuck with me and it's a shame it's taken me this long to visit. 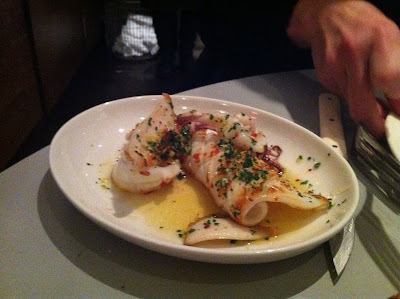 But I can't help that right now, in 2010, although perfectly decent, Theo Randall is playing second fiddle to Polpo/Polpetto, Zucca, Trullo and (though I'm yet to visit myself) Tinello, and the fact is there is better food out there, and for less. Now, more than ever, a good restaurant experience is made by the perception of value, and at £156 for two (admittedly including a £39 wine but there wasn't much on the list under £35) for a decent but hardly stunning meal, I really can't describe this as such. Other than the hefty prices, Theo Randall at the Intercontinental aren't doing much wrong, it's just a shame for them that, thanks to the efforts of a handful of exciting new Italian restaurants across the capital, the rules of the game have changed. I wasn't the biggest fan of Terroirs, in Covent Garden. Most of the food I ate, while perfectly fine, was slightly on the safe side (terrines, saucisson, polenta, snore), and the experience of sitting at a wobbly table in that huge, noisy subterranean room was quite uncomfortable. Perhaps if I was a fan of natural wines I would have been able to get more out of it, but I could no more get excited about a well-chosen wine list as I could about the brand of soap used in the loos, and so even a very nice bottle of natural Vouvray wasn't enough to tip the balance. 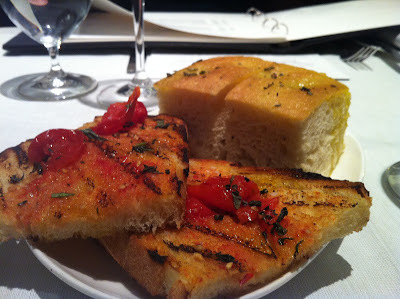 What bothered me more than my mediocre meal, though, was that so many other people really liked it. Raved about the place - friends, critics, and bloggers united in universal and lavish praise about the wine list, sure, but also the Cantabrian anchovies and the duck scratchings and the rum baba. At times I was almost tempted to give it another go, but months passed and other (better) restaurants came along and Terroirs was forgotten. And so if it wasn't for the fact that Brawn, Terroirs' new sister restaurant, has opened a few steps away from a friend's flat in Hackney, I probably wouldn't be beating a path to their door, either. My hopes weren't high for another evening munching cold duck rillette and staring uselessly at an incomprehensible wine list, and being so close to Viet Grill and Due Sardi (top new authentic Italian takeaway, review coming soon) and Hawksmoor, the competition for our dinner dollar was fierce. But off we went anyway, more out of a sense of duty than anything else, and enjoyed a meal that, quite unexpectedly, turned out to be one of the highlights of the year. Four plump rock oysters were served with a decent mignonette and presented nestled upright on a bed of sea salt to as not to lose any of the precious liquor. 2010 really has been the Year of the Oyster for me, and I've enjoyed everything from the flat, firm Colchester natives to the thick creamy rocks like these. 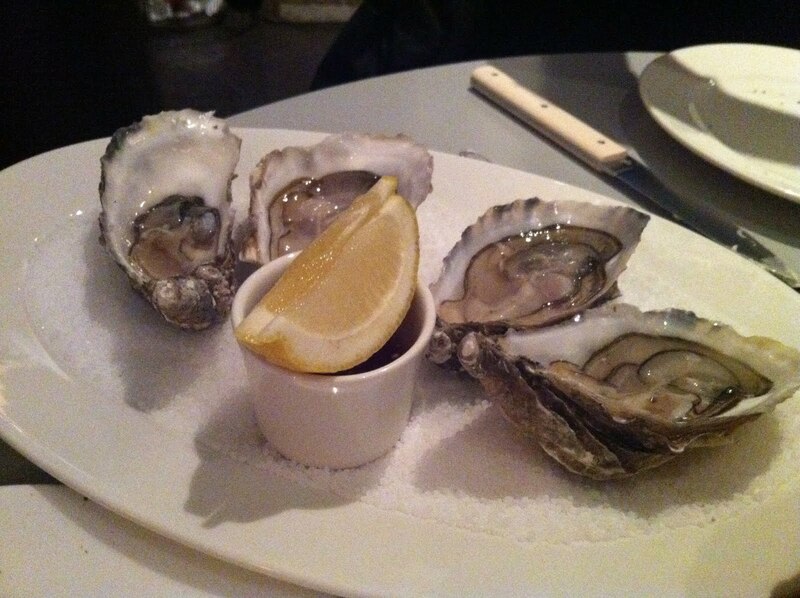 You'd think shucking and serving an oyster wouldn't be the greatest test of a restaurant's skill but it's surprising how often you see sad, dry specimens that have lost too much of the juice inside, or alternatively crack your teeth on some shattered shell from inprecise opening. These were great. 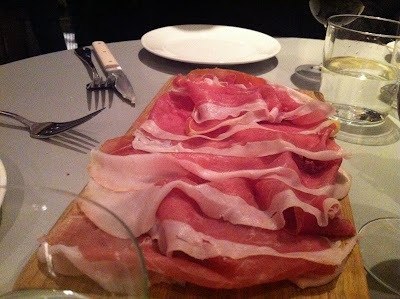 Parma ham, while not up there with the best Spanish Iberico (and let's face it, what other foodstuff is) was still moreishly salty and porky and disappeared in a flash. Clearly a grade above the bland, wet variety you see in supermarkets, but then you'd hope so for £12 for 8 slices. 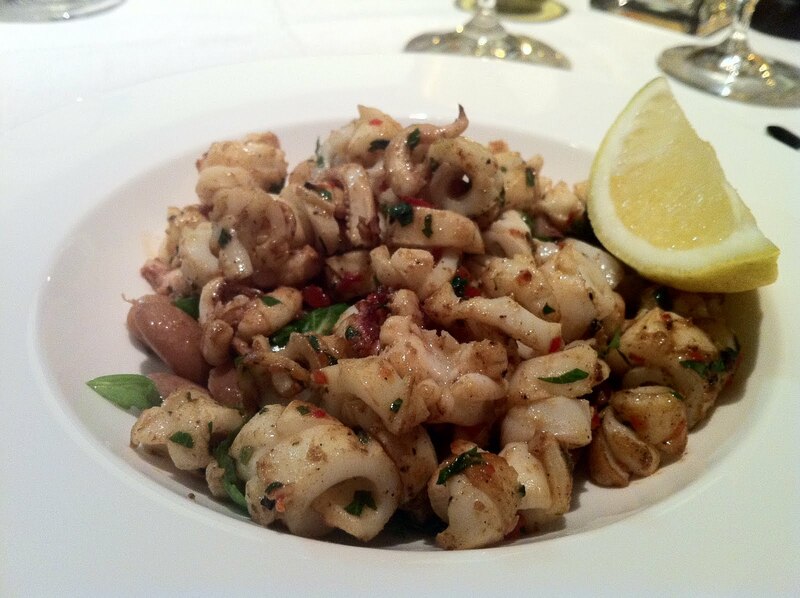 Of the starter size portions (in common with Terroirs, the menu is rather confusing, with no clear distinction between starters and mains, leaving you as a punter to guess portion size from the prices), Cornish squid, chilli & gremolata was very nicely done, the herby dressing subtly shot through with chilli and the flesh of the squid moist with crispy edges. Also not pictured is a thick, rich soup of blended puy lentils and sweet ham hock, which I only wish I could have taken home and keep overnight for the flavours to deepen slightly. Even so, pretty good. Then the real fireworks began. 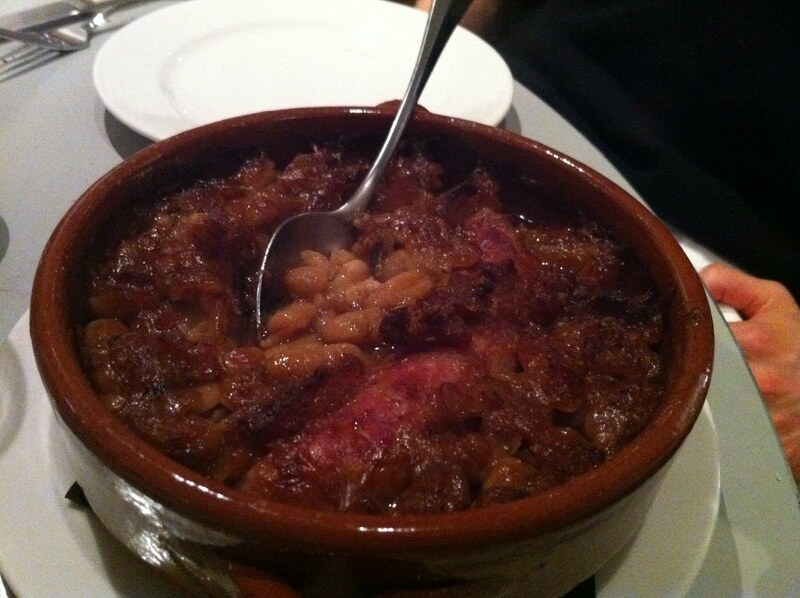 This is something called Mongetes, apparently a kind of Catalan cassoulet containing white beans and sausage. It was absolutely brilliant - the sausage was top quality, loosely textured and meaty, the beans incredibly deeply flavoured, as comforting as a rich embrace, and they had even crunched up the top somehow - perhaps with toasted breadcrumbs - to provide a gorgeous extra layer to crack through to reach the mixture below. Almost perfect. These three slices of juicy mushrooms were topped with bone marrow (if 2010 wasn't the year of the oyster, it may be the year of the bone marrow), garlic and parsley. 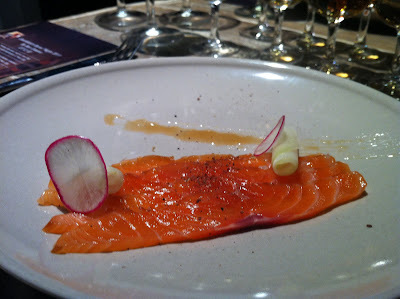 Perfectly seasoned and bursting with earthy flavours, it was a combination I'd not seen before but worked brilliantly. And then, as if all that wasn't enough, the standout dish in an evening full of standout dishes - Zander boudin in lobster sauce. 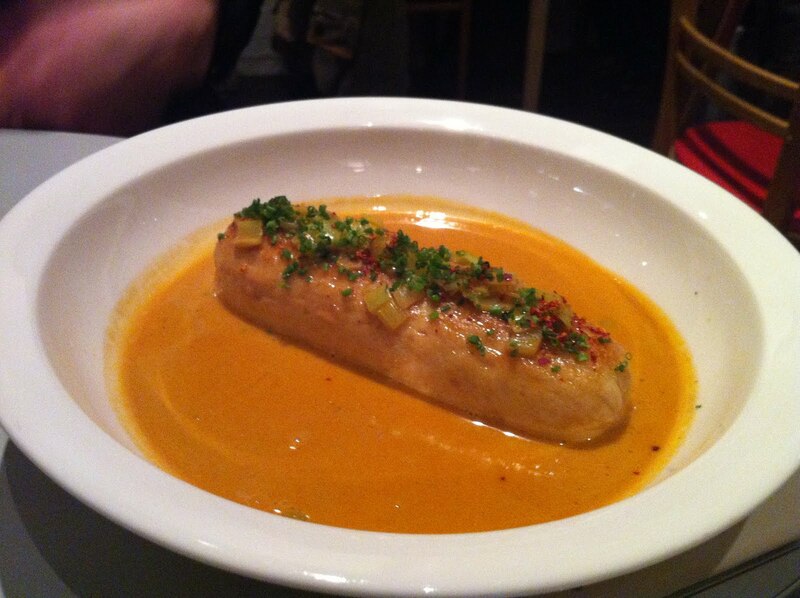 Imagine an impossibly thin sausage casing filled with ethereally light and stunningly flavoured fish (a relative of the pike I believe) mousse, topped with herbs and chilli and surrounded by the greatest lobster bisque you've ever had in your life. I've never eaten anything like it before, although I believe it's a relatively common bistro dish in certain parts of the world (France), and I swore after mopping up the last remnants of the bisque with the (excellent) house bread that this definitely wouldn't be my last. Heavenly. We were having so much fun, giggling with joy as each new dish appeared before us, that after the mains were gone we couldn't let the evening end and ordered dessert. Floating island was very well done, the blob of light meringue surrounded by a cool vanilla custard; what really made it though was a sprinkling of salty caramel, providing texture contrasts and bold seasoning. Despite initial misgivings, and possibly admittedly partly due to low expectations, my meal last night was a joy from start to finish. Staff were friendly and professional, knowledgeable about the wines (just as well in my case) and enthusiastic about the food, and the room we ate in - towards the back, near the open kitchens - was whitewashed and funky in that Shoreditch warehouse way without being uncomfortable. 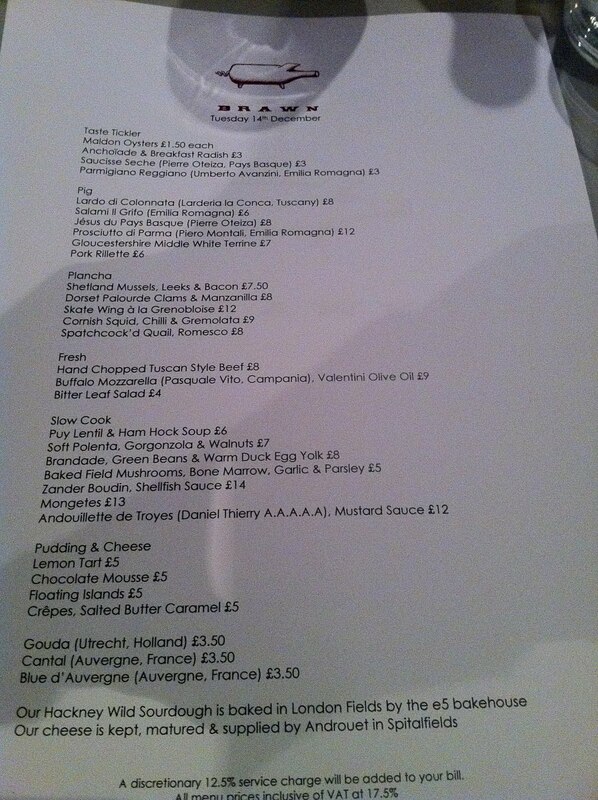 Perhaps the slightly more rough and ready location has given the brains behind Brawn (excuse the pun) the freedom to serve the food they want to serve without fear of offending any Covent Garden day trippers, but I couldn't shake the feeling that rather than simply being Terroirs' "little sister", Brawn is already shaping up to be a much more mature and accomplished operation. I can't wait to go back, to work my way through the rest of the menu, have another fix of the mongetes and the boudin, and get slowly and naturally sozzled. It's a restaurant with everything going for it, and everything to recommend. Go now. "Good in parts" was how the curate famously described his egg, the humour (such as it was in 1895) deriving from the fact that if any "part" of an egg is bad, the whole thing is spoiled - poor old curate was just trying to make the best of a bad situation. Ho ho ho. "Good in parts" is also a phrase that quite accurately describes a lunch I had at Kopapa, Peter Gordon's new gaff in Covent Garden, although how well the curate metaphor stretches in this situation is up for debate. 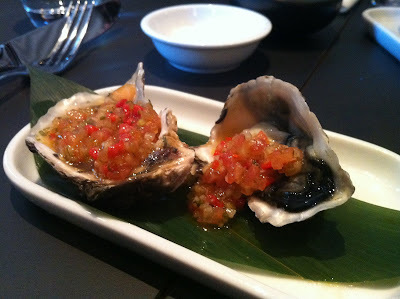 A restaurant probably can be partly bad without the whole thing being ruined - one lousy dish may not necessarily spoil an entire meal, especially if there are enough interesting and tasty bites elsewhere to offset the disappointment. And with that in mind, I am happy to describe Kopapa as "good", despite one disastrous dish that never should have left the kitchen and nearly derailed the whole meal. 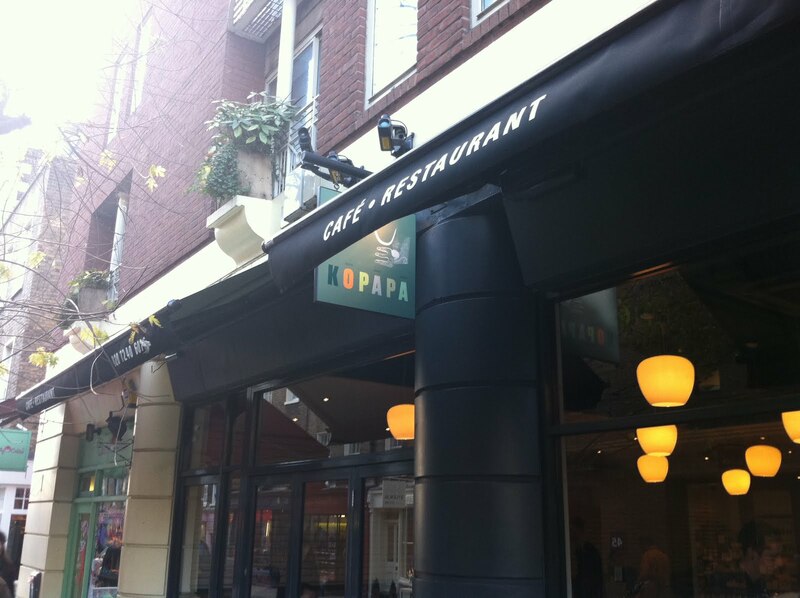 It being opening week, and with 50% off the food bill, there were many issues with timing it would be unfair to dwell on - I'm sure in the fullness of time everything will settle down and future guests at Kopapa will not have to wait quite so long between courses as we did. Service otherwise though was friendly if a bit elusive, and perhaps we are as much to blame as anyone for turning up as a party of eight then ordering two of everything on the tapas menu - a challenge for any restaurant, never mind one a few days old. 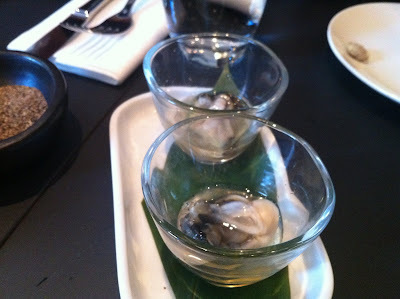 First to arrive were three styles of New Zealand oysters, and were classic Antipodean fusion food - reading badly (oyster and miso gazpacho, oyster and sake broth) but tasting good. 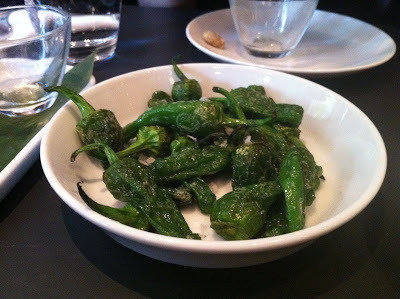 Padron peppers didn't look "deep fried" to me, just prepared in the traditional Spanish way, lightly salted, and were no worse for that. 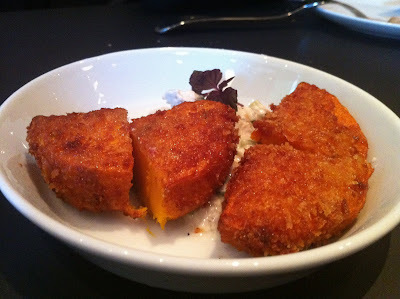 And a breadcrumbed chunk of butternut squash was firm inside and crunchy out, delicately spiced and served with a refreshing cucumber raita. Chorizo beignets were surprisingly flavourless for what is normally a strong and spicy meat - perhaps it was lacking a little of the main ingredient, because a separate order of "grilled chorizo" demonstrated that there was nothing wrong with the meat itself - these were crispy and rich and moreish. 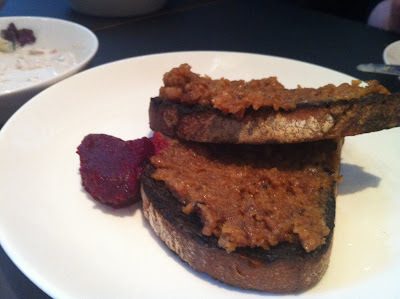 Parmesan and bone marrow on toast was fantastic - silky and beefy with a good sharp blob of beetroot and horseradish to fight the fat, but a duck liver parfait was fairly one-dimensional and hardly better than anything you could buy ready made from a supermarket. There were a number of other dishes that ranged between OK and good that it would be too tedious to list here, but overall I got the impression that this was a competent kitchen cooking innovative and interesting food, the kind of thing we could do with a lot more of in London. That was, until the "steamed buns" arrived. They were basically raw. 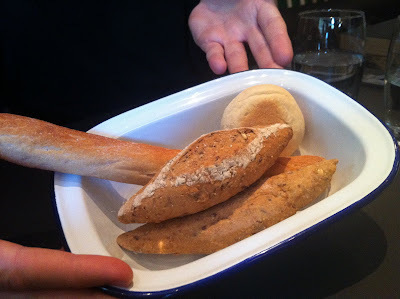 Not just undercooked, not merely past their best, completely and utterly raw - sad, soggy sacks of claggy dough that coated the mouth like putty and tasted of nothing other than bitter flour and water. We mentioned this to a waiter, who apologised but didn't appear to take anything off the bill - a detail with the 50% off offer you may think, but even at half price these were still £2.40 and a second glance from anyone checking the food leaving the kitchen would have immediately spotted something was wrong. It wasn't just that Kopapa can't do Chinese food, either - prawn siu-mai were very nicely done, with delicate thin coatings and a firm seafood filling. So who knows what story is behind the production of those buns - all I know is they were a disaster. Looking past the catastrophic steamed buns though, Kopapa is still a restaurant that shows promise. The bold inclusion on the tapas menu of "chickpea-battered lamb's brains" won't be everyone's cup of tea (it wasn't really mine - I tasted one in a spirit of daring adventure but the creamy, formless texture of brain still doesn't quite do it for me) but at least shows confidence, and they were cooked as well as you could cook anything that came out of a baby sheep's skull. House bread, too, was genuinely fantastic - nicely seasoned, good crusts, light and buttery inside, I'd like to think they are made in-house but if not, they have a good supplier. Trying to get an overall impression of a place from a shaky soft opening is difficult - and possibly rather unfair - but judging from dishes such as the marrowbone toast and the oysters I would like to think Kopapa could grow into an interesting and characterful restaurant in a location - Covent Garden - hardly blessed with a surplus of such places. Nothing was mind-blowingly great, and some things were pretty awful, but at least it's not another branch of Nando's and I'll take promising and enthusiastic over predictable and anodyne any day of the week. Good luck Peter Gordon and Kopapa, then, and here's hoping, in the end, that "good in parts" is good enough. If you think food and whisky matching sounds too crazy to ever work, then I refer you to the Burns Night meal I attended in January last year at Min Jiang. While the standard of the dishes was variable, the ability of this fiery spirit to compliment the robust flavours of Chinese food made for a thoroughly enjoyable evening, although admittedly a large part of that may have been due to the generous measures of Scotch. 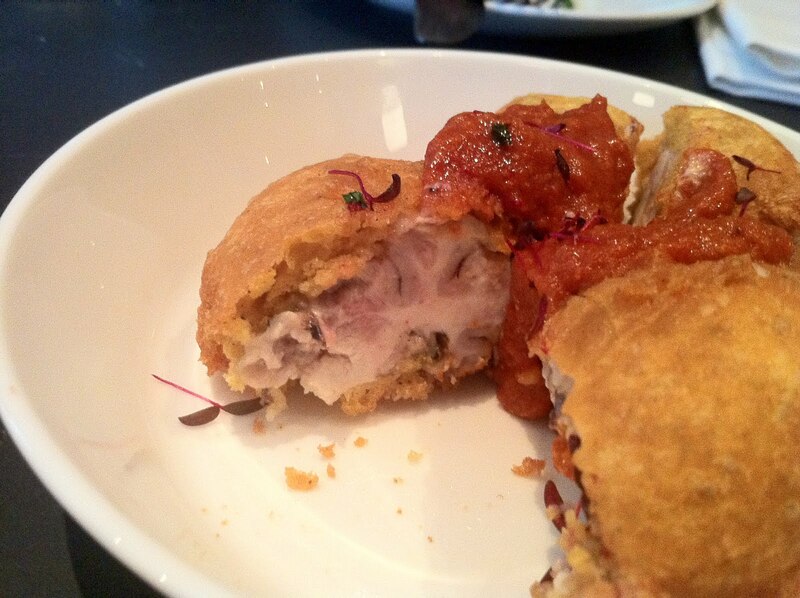 But haggis dim sum and garlicky, sweet roast duck pancakes must surely be easier to work with than the delicate and inventive Noma-influenced dishes Ben Greeno creates, and it must have worried even a chef of his talents when he was approached by Glenfiddich to design a Burns Night menu. So, how did he do? 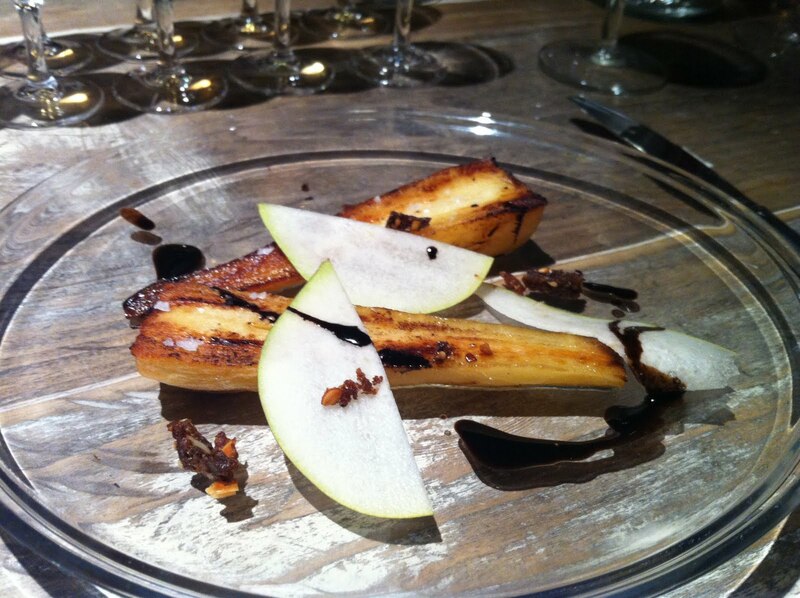 First course was a couple of slices of warm parsnip, crispy pear and some nice sweet rye bits. Seasoned with flakes of Maldon salt and containing a great mix of textures, it would have all been interesting enough without the astonishing addition of something called 'malt oil', as far as I know an invention of Greeno's although if anyone has seen it before feel free to comment. It's an interesting thing, is malt. While in the US they've been slurping malted drinks for as long as anyone can remember, and very nice they are too, in the UK our only exposure to it would have likely been the filling for Maltesers or, if you're old enough, the bedtime drink Horlicks. I don't know why this should be the case, as the malt oil here added a lovely extra dimension, nutty and sweet, and made the match with the Glenfiddich 12 seem perfectly natural. Cured - note not "smoked" - salmon was topped with pickled kohlrabi, crunchy radish and a slick of gorgeous caramel sauce, another exciting combination of textures and flavours reminiscent of the stunning mackerel sashimi dish I'd had here a few months back. But the whole thing was lifted into something even more special by a few flakes of ground Szechuan pepper, which enlivened the taste buds with a metallic buzz and had the tops of our tongues tingling for a good few minutes after. Looking like slices of gooey chocolate cake, these were in fact slow-cooked slabs of beef cheek in a deliciously rich sauce that had been infused - I'm not making this up - with essence of whisky barrel. 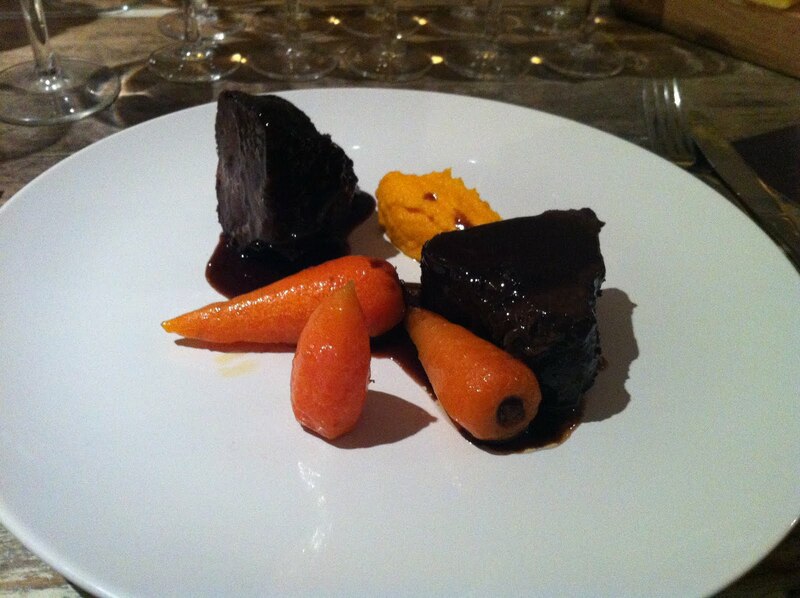 Beefy, oaky and tender, and served with roast and puréed carrots, it was another wildly inventive and expertly cooked plate of food and had me feverishly mopping up every last drop of THAT sauce with chunks of bread. 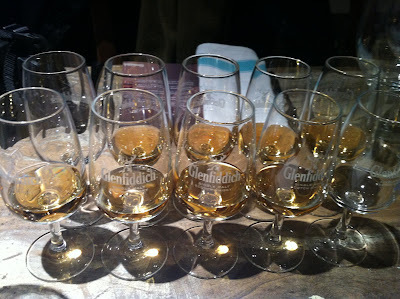 Glenfiddich Rich Oak was a sweeter, richer variation which matched it well. 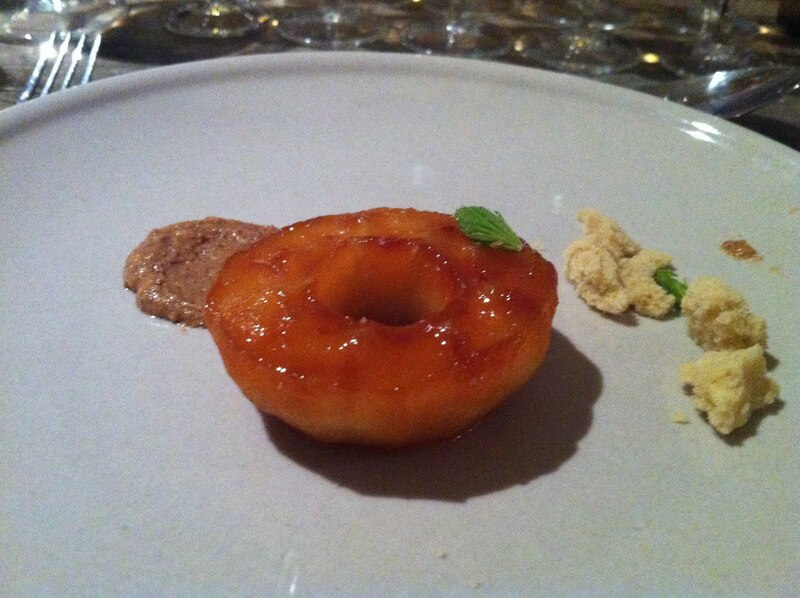 This caramelised slice of apple was dressed with pine buds (which also made an appearance in my favourite dessert from the last meal) and some crumbled financier pastry. An intense praline continued the almond theme, and echoed the nutty 15 year old whisky it was served with. Super. 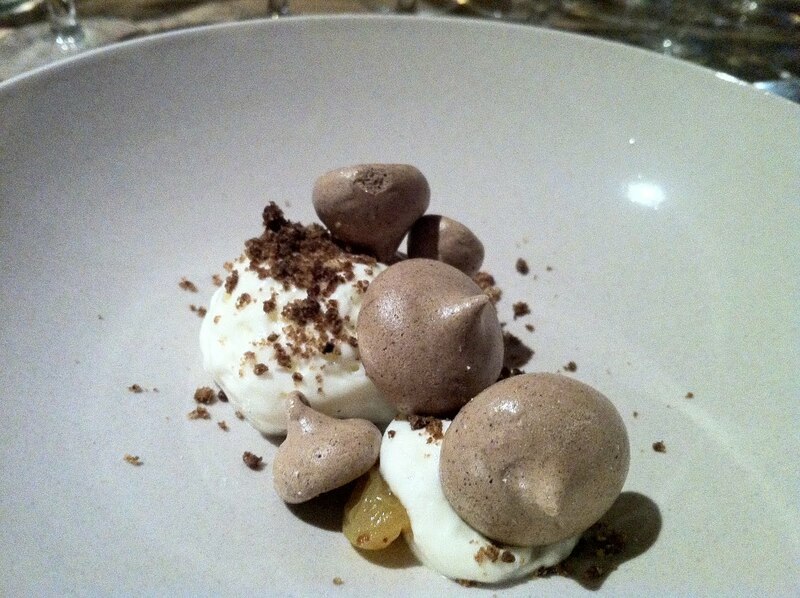 And then, finally, the most interesting and accomplished dessert I've enjoyed for many years. "Vanilla mousse, malt cookie, elderflower" doesn't sound like much on paper, but on the plate it was nothing short of extraordinary. The malt cookies were like the inside of Maltesers - no bad thing - only lighter and with a more addictively crunchable texture. The "mousse" was actually fluffed up natural yoghurt, providing a moist dairy coating to the crispy cookies, and hidden under it all were these amazing fat raisins that had somehow been infused with elderflower and burst with fragrant freshness in the mouth. Unique, inventive (I keep using that word but it's more true of Ben Greeno's food than almost anywhere else I can think of) and delightful, it's a dish that wouldn't have seemed out of place in any 3 Michelin star restaurant. Ben Greeno is serving his Burns Night menu for just one week, starting 17th January 2011, and I feel guilty enough having been treated to this stunning meal without having to tell you that at the bargainous price of £40/head including matching whiskies and such limited spaces, getting a spot is most likely going to be very difficult. 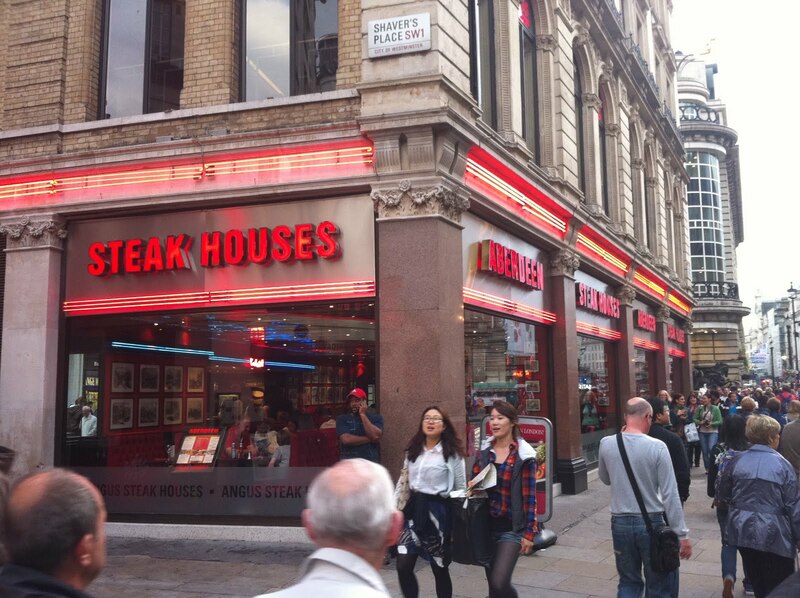 But has finding a great, sensibly priced dinner in London really ever been easy? 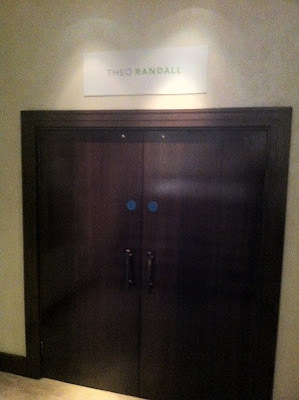 And how many other opportunities do you get to eat such frankly world-class food in such an intimate and exclusive setting? I've said it before and it's worth repeating - wonderful though the evening was, this is a chef whose talents have already outgrown a secret supperclub in the East End and you should do whatever you can to try his food before he travels to pastures new, as he surely will and has every right to. 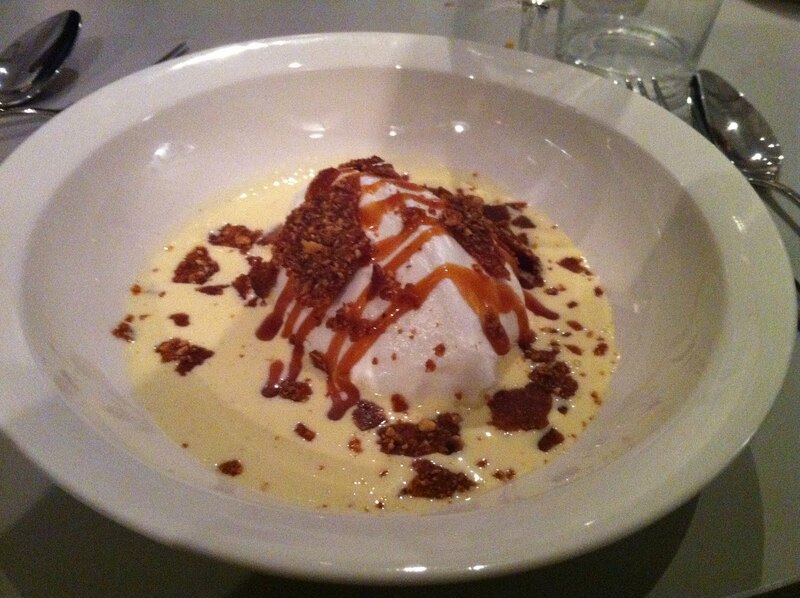 And then, many years from now, when he has his own world-famous restaurant and a range of branded cookware, you can tell your friends of the time when, in a secret location in East London, you had your first vanilla mousse, malt cookie and elderflower dessert. 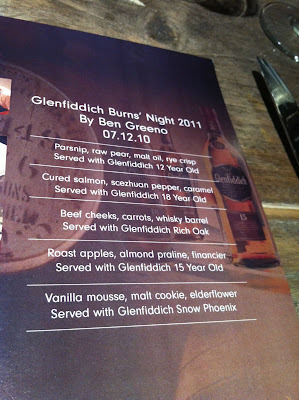 The Glenfiddich Burns’ Night menu by Ben Greeno costs £40 per person and spaces are extremely limited. Email GlenfiddichBurnsNight@gmail.com to request a seat. I was treated to this meal by Glenfiddich. On a freezing cold evening in early December we slipped and slid and skated our way through unlovely Kennington streets in search of a meal. I used to live round here, and for better or worse it hasn't changed much in five years - the Fentiman Arms is still a comfortable if somewhat corporate "gastro" pub, and over a pint of Staropramen before the meal I tried to think if there was anything I missed about the place. Being two minutes from Oval tube station was handy, obviously. And there used to be an interesting little French deli around the corner. But other than that, not really. It's a strange no man's land between the urban charge of Brixton and the more salubrious attractions of Clapham and just feels even now like a giant, ugly corridor designed to efficiently herd traffic through to somewhere more interesting. Here we were anyway though, and here too was Adulis, an Eritrean restaurant that has been serving injera and foul to the attention-starved residents of Brixton Road since 1996. 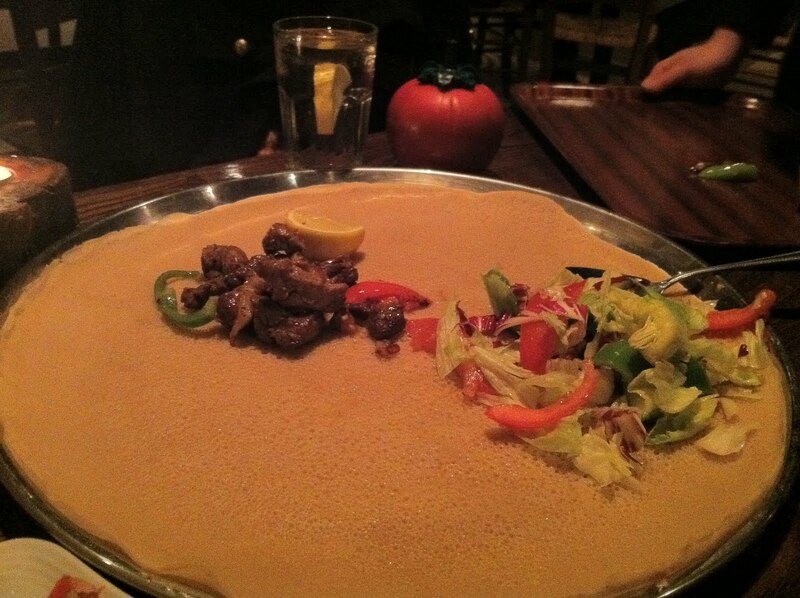 It was Zigni house, back in August, that first really turned my taste buds on to Eritrean food. 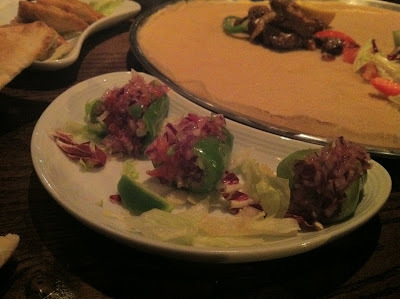 Not a perfect restaurant by any means - service was reclusive and we had to shift tables a couple of times until we found one that wasn't excruciatingly painful to eat off - but it was nevertheless thoroughly enjoyable; fresh, spicy, exciting and - most importantly - cheap. So my hopes for Adulis were similarly high, even once I'd noticed that the price points on this menu seemed a notch or two above the other place. We took a scattergun approach to ordering in order to build as varied a meal as possible, and hoped it would all be worth the effort. Things started well. Foul (pronounced "fool") was a warm oily broad bean and onion mixture, served with piping hot pita bread and was remarkably deeply flavoured for a vegetarian dish - I particularly liked the topping of (presumably home made) cottage cheese, which was slightly annoying because we had been told the cottage cheese as a standalone dish wasn't available. Three crunchy stuffed chillies were notable mainly for the sheer eye-watering level of chilli heat, although I did still like the refreshing tomato/onion salad inside. Best of all though were sambusa, sort of an African samosa using delicate filo pastry, which contained a lovely balanced meat (beef?) and onion mixture. I'm prepared to admit it was mainly our fault the mains didn't live up to the starters, as the stew we'd ordered for the main injera platter - the Adulis Special lamb - was really too dry to create the lovely gooey injera-based slop we'd enjoyed at Zigni House. Having said that though, I would have appreciated a member of staff being more pro-active in offering advice to two clueless Eritrean cuisine beginners. 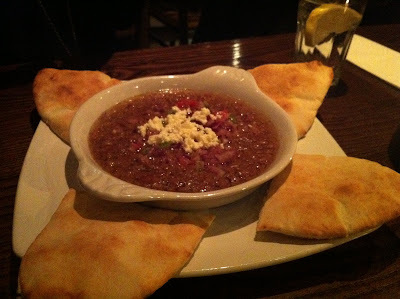 The spicing in the lamb was great, and I loved the way they brought it out on a little sizzling pot over flames, but there wasn't enough richness or moisture to fight through the sour bread, and I'm afraid the end result was rather disappointing. Not inedible, just disappointing. 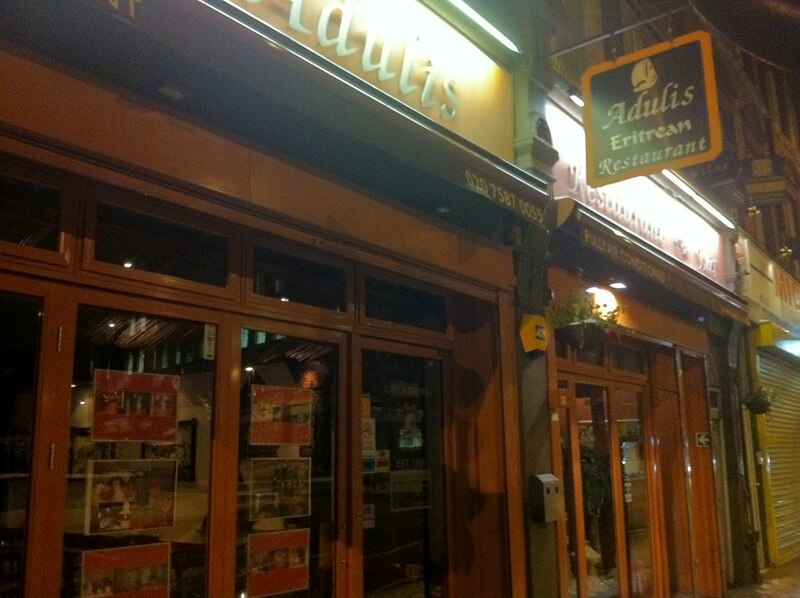 At a full £10 more each than Zigni House (just under £30 a head with a bottle of wine), Adulis had that much more to live up to, and I can't really say it did. 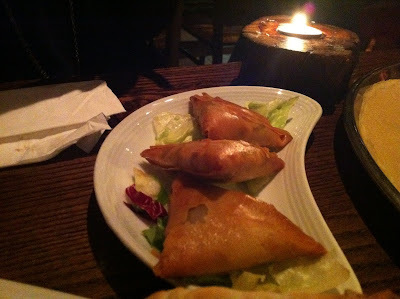 In fact, if anything the food here was slightly less exciting than our meal in Islington, even taking into account the superb sambusa and the (for me anyway) still entertaining novelty of eating without cutlery. But, if you find yourself in Kennington, or God forbid if you live here, there must be far worse places to spend your money and at the very least our meal was tasty, fresh and served with enthusiasm. As for whether I'd go back, well, the next time I'm hungry in Kennington I'll certainly consider it. Although, the next time I do find myself in Kennington, there's a very good chance I'll just be halfway to somewhere else.